Take a trip to the entertainment capital of the country, Branson, MO, to enjoy some of the most outrageous and fun dinner shows available! The Majestic Dinner Theater serves up great shows and meals to everyone who visits, and Branson’s Murder Mystery Dinner Show is sure to impress. Buckle in for a presentation of 'Murder at the Town Vote', a rousing ‘whodunnit’ mystery that is full of wacky hijinks. There is never a dull moment at one of these shows with guest actors pulled straight from the audience, so don't miss out on this evening full of murder, mystery, and great food! Every evening at Branson’s Murder Mystery Dinner Show starts off with a delicious buffet-style meal, since crime fighting and mystery solving can definitely work up an appetite. The Majestic Theater truly prides itself not only on its shows, but on its food, and as such every meal is freshly made in their kitchens by talented on-site chefs. The dinner menu for “Murder at the Town Vote” features an amazing spread of delicious homestyle dishes. Sink your teeth into Aunt B’s baked chicken (chicken roasted to perfection), pork and ground beef meatloaf, savory mac ‘n cheese, southwestern chicken, roasted potatoes, green beans, a huge salad bar with a variety of cheeses, toppings, and dressings to choose from, homemade dinner rolls, and unlimited tea, water, and lemonade. Whether you want a comforting down-home style meal or a fresh salad dinner, there is something for every set of taste buds. Transporting you back to Branson's history, Branson Murder Mystery Dinner Theater plunges you right into the center of a murder mystery. An innocent citizen is murdered at the town vote, and the authorities need your help in bringing the culprit to justice. Figure out 'whodunnit' in this action-packed dinner theater adventure. 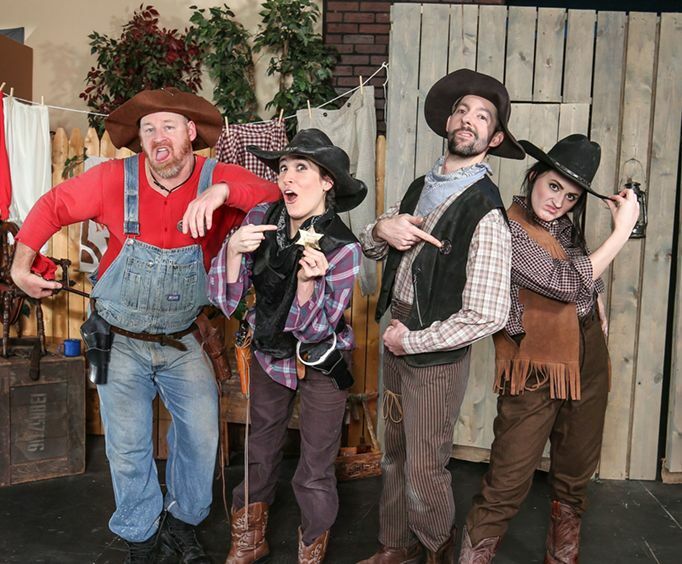 Ten characters are cast from the audience to participate in the show, handed a cowboy hat and prop six-shooter, and immersed in the mystery. By playing key role in the show, these audience members are thrown right into the mix of the mystery, and it's your job to solve the case! Casted audience members are given a character to portray, and the roles vary from innocent bystander to the murderer himself (or herself). Either way, the audience must piece together the clues, keep an eye on the suspicious characters, and solve the mystery to save the city. For those who choose to participate alongside the cast of talented performers, you will don the personality of your character for the evening while getting in on the action and becoming part of the show. If you are a bit shy or simply want to sit back and solve the puzzle, you can do that as well! Whether you participate in the show or not, it is your job to figure out just what is going on, and you are sure to enjoy every moment of this live entertainment extravaganza. Audience members will have to have a keen eye to spot different clues and to finally help save Branson from the murderer. 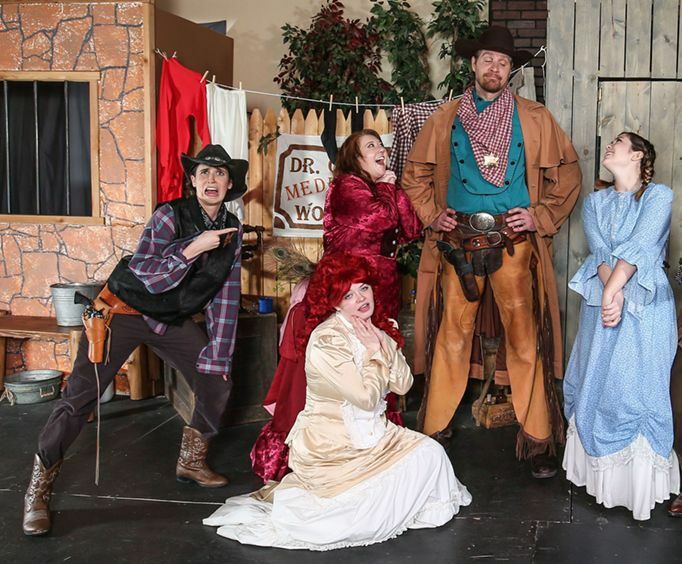 Branson's Murder Mystery Dinner show is sure to be a blast for all ages. The holidays have never been more interesting than with the Branson Murder Mystery Dinner Show’s “Murder By Eggnog” dinner show. Bring some fun and mystery to your Christmas celebration by taking a trip back in time to Branson in 1898. Join everyone in getting ready for the big annual Christmas Pageant, and be shocked as one of the innocent citizens is murdered in a thrilling plot twist. More than 12 roles in this show are filled by audience members. As well as your classic murder mystery that the theater is famous for, guests will also be able to sing along with their favorite Christmas songs put on by talented singers.. The 'Murder by Eggnog' show was a blast in 2018, and it is set to be just as amazing this season. The Christmas shows begin on November 1, 2019 and run through December 31, 2019. Located at 2849 Gretna Rd, the Majestic Dinner Theater is Branson famous for serving up amazing shows and quality entertainment for more than 18 years. There is a variety of different shows to see, most of which are served up alongside a delicious meal with the tickets. Each meal here is made fresh, daily, by talented in-house chefs for an authentic down home feel. These buffet menus are bursting with flavor and featuring everything from chicken roasted to perfection and meatloaf. Other awesome Grand Majestic shows include the Comedy Hypnosis Dinner Show and the Johnson Strings. With fun and intimate table seating, you are sure to enjoy a great evening with your mother, brother, family, and friends! Mystery, intrigue, and tons of fun await you with Branson’s Murder Mystery show.. This activity does a great job at bringing something completely new to Branson entertainment seekers, allowing them to simply enjoy making new memories with this awesome live event. It is different than the country music and live music performances that the city is known for. Join in on the action and you may even become part of the show. Either way, you won't leave hungry or without having a good time in Branson, the famous entertainment capital of the country! Get your tickets today! 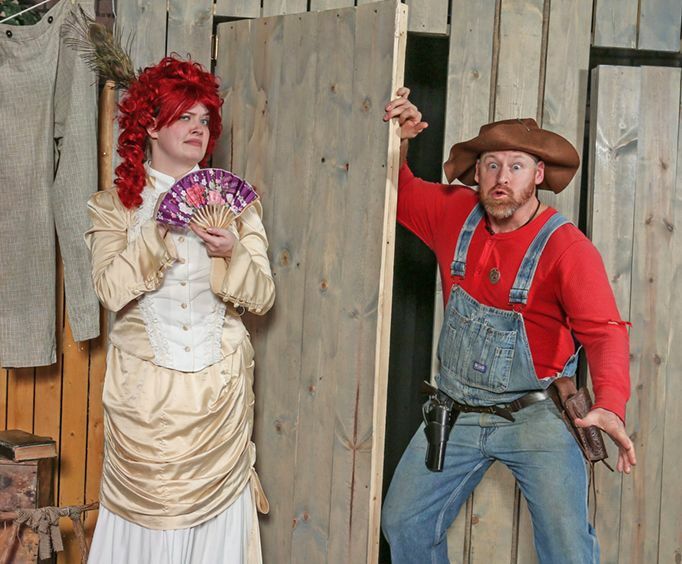 What is included in the admission price for Branson's Murder Mystery Dinner Show? A buffet dinner is included with your ticket. Approximately how long is the Branson's Murder Mystery Dinner Show? The show is approximately two hours long. The show is held at the Grand Majestic Theatre. Salad Bar featuring: Iceberg/Romaine lettuce, sliced tomato, cucumbers, yellow onion rings, shredded carrots, bacon bits, shredded cheddar cheese, diced ham, green bell peppers & ranch, lite Italian, Thousand Island dressing, croutons, saltine crackers. Great show. Enjoyed the interaction from the guest. The actors and actresses were funny and very intertaining. Hope they continue to stay in branson. "Great time, would do it again." Never having been to an audience participation dinner theater before we did not know what to expect. It was a blast. The cast pulled all of the audience into the play one way or another. Great time, would do it again. "We really enjoyed the dinner and had plenty of it"
We really enjoyed the dinner and had plenty of it. The show had a good script and the actors were pretty good. One of the actors was hilarious and kept us laughing. My husband was the only one of us who solved the murder mystery, but we all had a fun time trying. Tip: Take part as a character if you get the chance. It was even more fun! "It's silly - funny - engaging - and clean!!!" What a wonderful - fun filled evening. Absolutely family friendly. It's silly - funny - engaging - and clean!!! The buffet is ok. Not fabulous but as good as many of the local restaurants - maybe even better. It's a long evening but worth it. Tip: Seating is a little tight. Go early. My husband and my son-in-law are big guys so we were able to get seats at the end of the table instead of in the middle.